Alipay started to provide their open platform service for corporate users. 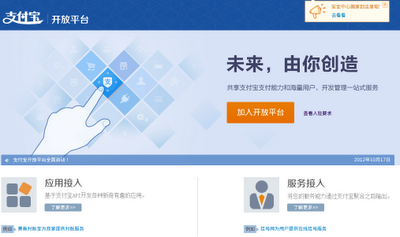 Alipay started to provide their open platform service for corporate users yesterday. They publish APIs of payment, accounting, billing, trade, sales and so forth. At the moment, Alipay only provide its APIs to the corporate user, but they will also provide them to the personal users in near future too. 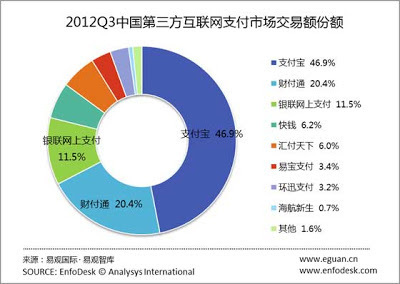 According to the report from Eguan, Chinese online payment market size was 976.4 billion RMB(=155.04 billion USD) , and Alipay have 46.9% market share in the third quarter. They would like to increase their partner by this open platform, and it seems that they would like to establish their firm position in the Chinese online payment market as ever.